Cowboy – an English speaking Vaquero? – Hiding in Plain Sight! There is no more iconic American figure than the Cowboy. The generic English language terms when combined have lost their original meanings as boys possibly herding or milking a cow. Most anywhere in the world, the term cowboy refers to that ironically American (U.S.A. American) figure. In recent years, there has been an upsurge in seeking to define the “real.” On the very extreme right is the American Renaissance which seems to believe that the real America was created and sustained by native (native in the sense of those who began coming to these shores in early 1600s and not those natives who were there to greet them) white English-speaking males. (See for example – Rep. Steve King warns that ‘our civilization’ can’t be restored with ‘somebody else’s babies’, By Philip Bump, Washington Post, March 12, 2017; Steve King Says Civilization Can’t Be Restored With ‘Somebody Else’s Babies’ By MATTHEW HAAG, The New York Times, MARCH 12, 2017; and King defends controversial tweet: ‘I meant exactly what I said’ by Mallory Shelbourne – The Hill March13, 2017. The role of women (in a quaint form of long ridiculed Freudian beliefs about the role of women in procreation) was to continue the procreation of more white English speaking males who were creating American Civilization. The Freudian view in a new disguise has new believers; the American Renaissance has become its most devoted and devout followers. One does not have to go that far to the right to find a vision of the real America being rural white English-speaking Americans. No group fits this image better than the romanticized iconic American cowboy of novels and films – not only in the U.S. but elsewhere in the world. The typical cowboy is a white English-speaking male. If in cowboy films there is any religion, it would be a nondenominational Protestant church in a Western small town. This image spans the spectrum of U.S. politics. On the right, two brothers lead a group to take over a National Wildlife Refuge in Oregon, essentially asserting that they are more real American than the constitutionally established elected national government. They of course dress like cowboys to assert their claim visually. Though they may have been raised on a ranch in Nevada, one of them manages a valet car fleet in a Phoenix, Arizona suburb and the other is listed as owning a construction company in Utah and having frequent problems with the local government. As would be expected, the iconic cowboy has become part of the debate over immigration and efforts to restrict it. 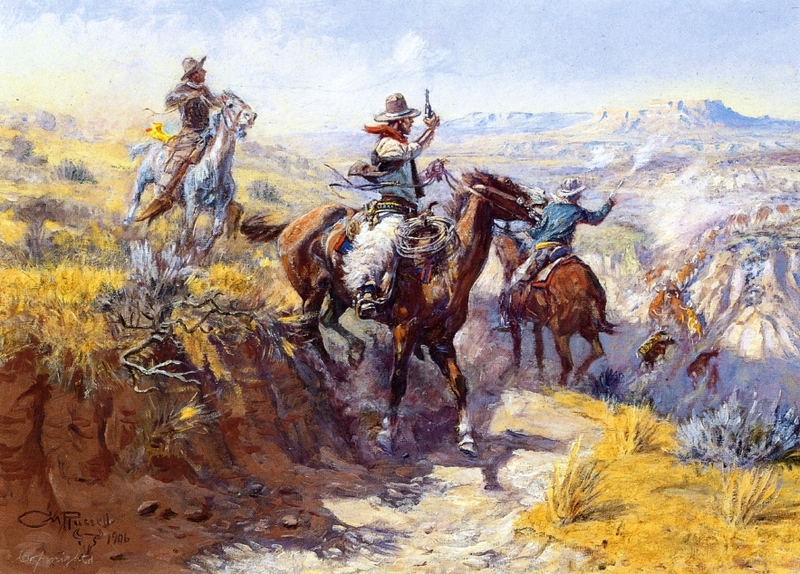 Frederic Remington and Charles Russell are considered to be the two greatest artists of cowboys and the American West that they inhabited. In an evening TV news story showing President Trump signing one of his decrees on immigration, one of Frederic Remington’s famous bronze sculptures, Bronco Buster, was visible on the President’s desk. Similarly, Daniel Pipes, in a rant defending President Trump’s policy of restricting immigration from six predominantly Muslim Middle Eastern countries, uses the image of Charles Russell’s Smoking Them Out. It is interesting to note that Remington’s 1889 visit to Mexico is rarely mentioned in accounts of his life or merely mentioned in passing as if it were of little significance. Yet he wrote extensively on it and the Mexican Vaqueros whom he studied. His drawing Mexican Vaqueros Breaking a ‘Bonc’ appears to be the model for his bronze Bucking Bronco (or Bucking Broncho as it was originally spelled). 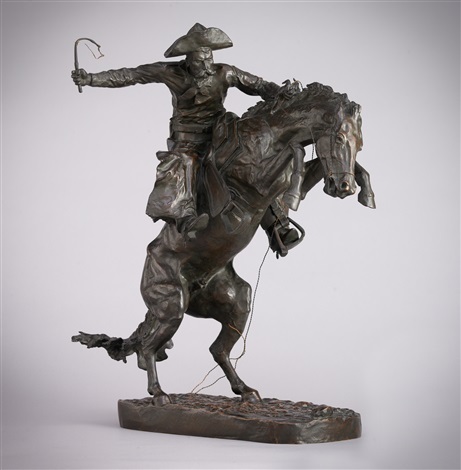 In other words, the Bucking Bronco statue on the President’s desk (replications of which can often be found around the world) may actually been a Vaquero and not a Cowboy? A BBC News story on 23 February 2017 opens with an image – “In the middle of a packed arena a cowboy clings on to a wildly bucking bronco” in which every everything seen in that image except the rider himself (and of course the pants he was wearing) originally came to the U.S. across what is now the border where a wall is to be built. When posted online the rider on a bucking bronco is not shown, though the accompanying text has the above quote. No mention either that the very word Rodeo comes from Spanish as does the Rodeo itself. It does open with a man standing in front of a Burrito (little burro) sign voicing support for the deportations underway and of course, the wall. The hats they wore would have come from Mexico and were decedent from hats worn by the (Buddhist) Mongols. J.B. Stetson took “sombreros” East, made some changes, and sold them around the world, including the American West, as Stetsons. The settlers coming from the East wore Derbies. The cattle in the picture would have been descended from those brought North with the settlers, got loose, and went wild, and which were much later crossed with Herefords which were brought from the East. Everything else in the pictures and statues, from the hat to the boots to the saddle and the horses, came to the American West via Mexico. There is a biting irony in these images at a time when issues of the U.S.-Mexican Border and the deportation of “illegal” immigrants is so much in the news. Essentially everything depicted in the sculptures and everything in the paintings came from across what is now the U.S. –Mexican Border, except that the pistol in a cowboy’s hand, which appears to be a Colt 45 Peacemaker, and the pants. Only the gun would have been brought West across the Mississippi. The pants would have been a product of two Jewish immigrants who may have entered the U.S. in the East but who set up shop in California (San Francisco) and Nevada (Reno) where the pants – Levi’s – were created and manufactured. Levi Strauss was born in Bavaria and Jacob Davis (nee – Jacob Youphes) was from Riga, Latvia which was then part of the Russian Empire. In 1598 when Don Juan de Oñate y Salazar crossed the river at El Paso Del Norte and followed the Rio Grande northward, he had settlers, horses and cattle. For the Vaqueros who drove the 7000 head of cattle, one could claim that they were among the first Cowboys in what was to become the United States. From Santa Fe (La Villa Real de la Santa Fe de San Francisco de Asísi) which he founded in 1609, the settlers spread out over what is now Northern New Mexico and Southern Colorado. In 1680 when the Pueblo Indians rose up and drove the settlers out, many of the cattle and horses became feral and began stocking the region with Mustangs and Longhorns. The Spaniards successfully and brutally returned in 1692. Many of the settlers were Conversos – recently converted Jews. In the last few decades, it has been increasingly understood that many of these Conversos in fact retained their Jewish religious practices in their home and in many cases, may have secretly retained their Jewish faith. Recently some in the region have reclaimed their Jewish faith. All this has opened up a new area of scholarly inquiry with Ph.D. dissertations, books and articles. This means that the Cowboy heritage not only includes the Catholicism of the Spaniards but the Judaism of the Conversos. Given the antisemitism of many of the real America proponents, it would be a supremely delicious irony if the first Cowboys in what is now the U.S. were Jews. That was 1598. The emergence of the iconic Cowboy after the Civil War is another story. We are just recently beginning to learn of the ex-slave slaves and other Black Cowboys. If there were significant numbers of Jewish Cowboys, it is a story yet to be told. In our era of celebrating multi-culturalism, I expect and look forward to future research finding more ethnic, racial, religious and other diversity than we now recognize. Whether Jewish Cowboys are found is as yet unknown but we can still celebrate them as the first American (north of what is now the U.S. Southern Border) Cowboys. The horses that the Spaniards brought to the New World were brought to them by the Moors (Arabs and Berbers) who were Muslim. Given that the horse was absolutely essential for herding cattle on an open range, one could argue that, fully understood, the Arab Muslim contribution to the Cowboy culture was more important than anything that came from East across the Mississippi River. In New Mexico where I spent my formative years through the completion of my Master’s Degree in Economics, the Hispano population claim to be the originators of the Mexican-American cuisine and that Tex-Mex, for example, is merely a derivative of what they created. I have never been able to find a decent sopapilla (also spelled sopaipilla or sopaipa) outside of this region. These cooking traditions were carried to Mexico by the first Spanish conquistadors, followed later by many Middle Eastern immigrants after the break of the Ottoman Empire. The latter is more responsible with el Pastor being a popular street food in Mexico, just like the Döner Kebab in Turkey, Souvlaki in Greece or Shawarma (from Turkish çevirme-to rotate) in Syria or Lebanon. The famous Fart Scene in Mel Books’ Blazing Saddles begins by showing a plate of beans. These beans were either the common bean – Phaseolus vulgaris (which originated in South America and is now grown on every continent except Antarctica —or the Tepary bean – Phaseolus acutifolius – which along with maize and squash formed the fabled Three Sisters of Mexican (aka Aztec) and North American agricultural row sequencing and rotation. One or the other beans probably became one of the crops of the settlers. In Spain, they are called judias o frijoles blancos. Whatever flatulence came from the East, it was not from either of these nutritious beans. Increasingly, after 1868, the Tabasco Sauce that the Cowboys put on their beans would have been produced on Avery Island in Louisiana; the Tabasco peppers (Capsicum frutescens var. tabasco) from which they were then and are now made originally came from the Mexican state of Tabasco. The McIlhenny Company claims to have formulated the sauce in 1868.
Who Were The Cowboys Behind ‘Cowboy Songs’? My Real America is a nation of immigrants that takes what is brought to it and makes it their own be it 100% from one group or a bringing together of traits from different groups. As such, the Cowboy can be seen as 100% American because we in America have made it our own. My Real America recognizes the various heritages that have allowed us to shape our country including the Vaquero heritage that created the modern Cowboy. Recent research is adding new diversity to our Cowboy heritage. In my Real America, the richness of the human endeavor allows us to violate (this one time only) basic arithmetic and allow someone to be 100% American and still have another heritage or even multiple other heritages. These multiple heritages enrich our culture and give it added strength and resilience. It is a dynamic interaction that doesn’t end with the initial appropriation but continues in a culture continuing to be receptive to new ideas. It definitely does not demonize or demean and seek to cut us off from those who brought us such a precious heritage as the Cowboy. One of the great strengths of our multiple heritages is that immigrant groups have continued to evolve their cultural contribution where it frequently flows back to the originating homeland and to the world. A view of the Cowboy as being uniquely an American creation falsifies it and denies its rich heritage. Walling ourselves off from any part of our rich, diverse heritage implies that we as a nation do not have the capacity to separate out that which is beneficial and that which is not. It provides only the delusion of strength but in the long term it cuts us off from the ongoing transformation that is necessary for success in our ever changing 21st century. What language are they speaking? Is it English? Should be spelled Broncho Buster (bronco – Spanish for rough) as Remington did and was the correct spelling at the time that it was created. The horse is being held by its mane and has a hackamore instead of a bit. Likely a Mexican Vaquero based on one of Remington’s paintings when he was in Mexico in 1889. One is sitting on Trump’s desk in the White House when he is issuing his anti-immigrant orders – what an irony which would be lost on him even if he knew the likely origins of the sculpture. Let me add that the horses in Russell’s painting are also outfitted in hackamores. The word “hackamore” from the Spanish word jáquima, Old Spanish xaquima, Arabic šakīma, (bit) from šakama (to bridle). Need I say more? As a Texan transplanted from New Mexico since 1959, I have to admit that there were real, honest to goodness Vaquero/Cowboys in Polynesian Hawaii before there were Vaquero/Cowboys in Texas.